This is a public service announcement for fellow ebay deal finders regarding the Cisco DPC3010 cable modem. I purchased the DPC3010 for use with my Suddenlink cable Internet package which is a 200 Mbps down by 20 Mbps up package. I originally had a Motorola SB6121 which is only a 4×4 channel DOCSIS 3.0 modem which was limiting my speed to approximately 100 Mbps down (50 Mbps channel x 4 channels). For more info on DOCSIS speeds you can check Wikipedia here. I found a really good deal on the modem. I think I paid about $10 for it on ebay (link to search). In theory, an 8×4 channel modem should allow you to get up to 200 Mbps on your cable package (50 Mbps x 8 channels). 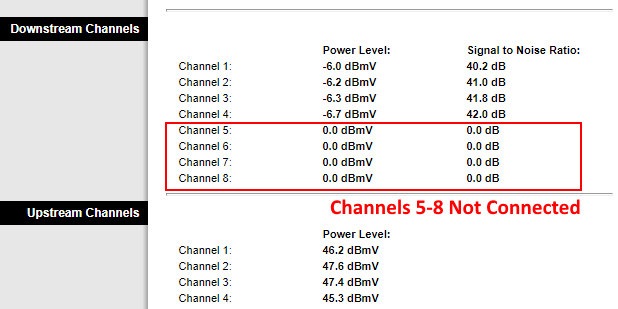 However, when connected to Suddenlink the DPC3010 would only operate with 4 of the maximum 8 channels. In conclusion, the DPC3010 is a super cheap modem (that does run a bit hot) if you have up to a 100 Mbps speed plan. However, don’t bother with it if you are on a 200 Mbps or faster plan on Suddenlink. Your experience with other providers may vary.